ounts of steam are needed for instance to heat up different processes. Our client operates several steam boiler, with a total capacity of more then 100m3 per hour. The feed water is treated chemically. Due to the high temperatures inside the boiler the demineralized water attacks the surface. This causes corrosion. Even chemicals used to prevent corrosion don’t work as expected in these harsh conditions. 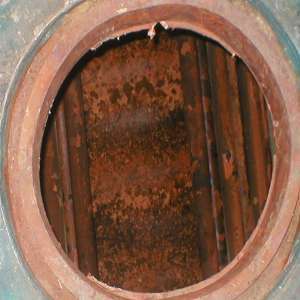 Rust particles are transported through the system in the steam, so the corrosion is not limited to one area. The result is material abrasion throughout the whole system, reducing the life time of the boiler and the piping system. We installed one Merus Ring at the feed pipe in front of the boiler. As a precautionary measure and to ensure the heating process no matter how the trial will go, no changes were made. The same water was used the same amount of corrosion inhibitors was added as before. 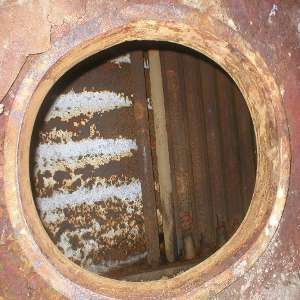 The iron content in the steam and the blow down pipe was checked regularly. In just a few weeks the iron content in the steam diminished and stabilized at a very low level. From the outside it was clearly visible, that there was less corrosion and rust. To avoid any risk, the steam boiler was operated under the existing conditions until 6 weeks before the yearly inspection. During the inspection we were able to evaluate the performance of the Merus Ring in the boiler. Parts of the surface in the boiler where black due to saturated iron oxide, also called magnetite. Compared to the last inspection only few red spots where left. The customer decided to stop adding chemicals. The iron content in the steam would be monitored in the future to verify the results. As a result, today the customer not only saves the costs for chemicals, but also service costs in the dosing system. Additionally we assume the life time of each boiler is enhanced, as no iron was found in the steam so far. This means that no material was eroded.